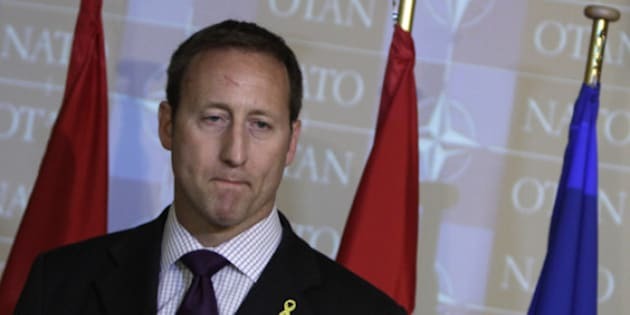 Defence Minister Peter MacKay has spent hundreds of hours and millions of dollars on Challenger jets since 2009, according to flight logs, with one trip costing more than $200,000. An analysis of the logs by CBC News shows between January 2009 and June 2011 MacKay used a Challenger for more than 471 hours. An hour on the Challenger in 2009 cost $10,104, including maintenance and the pilot's salary. MacKay has spent days defending himself over accusations he's abusing the VIP planes. He says he uses them only for government business, particularly to travel to repatriation ceremonies when Canadian soldiers are killed in Afghanistan. The logs show the cost of that. In July 2009, a Challenger flew empty from Ottawa to Tofino, B.C., to pick up MacKay and fly him to Trenton, Ont., for one of the repatriation ceremonies. It also returned him to Tofino an hour after the ceremony to continue his holiday, and flew back empty to Ottawa from the West Coast. The Challenger spent more than 20 hours in the air, at a cost of $205,111.20. Had he flown on a commercial airline, leaving the day before and returning the day after, an executive class ticket would have cost about $5,600 using the Comox, B.C. airport, a four-hour drive from Tofino. Charter service from Tofino's Long Beach Airport or other local charters to Vancouver, running up to a few hundred dollars for a one-hour one-way trip, would have offered other commercial flight options. In November 2009, MacKay was at a Canadian Forces appreciation night at an Ottawa Senators game. He got on a Challenger at 11:02 p.m. ET to fly to Halifax, arriving at 1:34 a.m. ET. The next morning, he announced infrastructure funding, then left on the Challenger again at 9 a.m. to fly to Toronto, landing at 10:47 a.m. The plane spent 4.9 hours in the air at a cost of $49,509.60. John Baird, then minister of transport and infrastructure, flew commercial. That cost $1,032.66. A spokesman for Prime Minister Stephen Harper says Conservative ministers take one Challenger flight for every six flights Liberal ministers used to take. "Not only has the use of these aircraft gone down under our government, they are also flying for fewer hours than they were under the former Liberals. For every week the Liberals flew, we are flying only one day," Andrew MacDougall said in a statement. Harper defended MacKay Thursday during question period in the House of Commons. NDP MPs, referring to a report that MacKay has taken nearly $3 million worth of flights on the government's Challenger jets since he was appointed defence minister in 2007, called on Harper to "ground this high-flying minister." In response to comments by interim NDP Leader Nycole Turmel, who said MacKay treats the planes like taxis, Harper said the defence minister uses the fleet of government planes 70 per cent less than his predecessors and that when he does use them, "they have been for important government business." Harper said half of the flights have been to transport MacKay to repatriation ceremonies. Harper signalled strong support for his embattled minister, saying MacKay goes to those ceremonies to show the government understands the sacrifices made by military families, "and that is why the minister of defence is so highly regarded on this side of the House." Harper tends to only answer questions from party leaders, but he stood to respond to several questions about MacKay from other NDP MPs. "When the member asks these kinds of questions and behaves this kind of way, he reflects on his own character, not on that of the minister," Harper told NDP MP Jack Harris. Calling MacKay the "frequent flyer champion of government jets," Harris said only nine out of 35 flights noted in a media report were to take MacKay to repatriation ceremonies. Following question period, MacKay spoke to reporters and repeated what Harper had said, that half of the flights were for repatriation ceremonies. It's the second week in a row that MacKay has been on the hot seat for his use of government planes. Last week, it was revealed that he was picked up from a fishing holiday in Newfoundland by a search and rescue helicopter and flown to a demonstration in Gander. MacKay said last week that he cut his holiday short for legitimate government business. After the demonstration, the rescue chopper took the minister to the Gander airport, where a Challenger jet was waiting to take him to London, Ont., for a government announcement. Then MacKay got back on the Challenger and flew to Halifax, so he could attend a lobster carnival in his home riding. When MacKay vacationed at a fishing lodge in Newfoundland he was the guest of Rob Crosbie, who is the chair of Marine Atlantic, the Crown corporation that operates ferry service between Nova Scotia and Newfoundland and Labrador. That revelation added to questions from the opposition about whether MacKay has acted appropriately. Crosbie said his family and MacKay's have been friends for a long time. The issue of MacKay's flights and vacation came up earlier in the day Thursday at a Commons committee where ethics commissioner Mary Dawson was testifying. She said she is aware of the report about MacKay's stay at the lodge but has not initiated an investigation. A spokesman for MacKay says he's been "consistently forthcoming with respect to his personal time." "Despite not having been contacted by the ethics commissioner, he has nonetheless proactively provided her office with a copy of a cancelled cheque which he tendered in the summer of August 2010 in full payment for his stay at a camp in the province of Newfoundland and Labrador. He received no gift or advantage from anyone, and there was thus no contravention of any rule," Josh Zanin said in a statement. One of MacKay's predecessors, Liberal MP John McCallum, said Thursday that he used government planes "sparingly" and that he never would have dreamed of being picked up from a private vacation in a government plane. "A government aircraft is not designed to pick ministers up from their holidays," he told CBC News.